Designed for contemporary graphic presentations, Horizon Banner Stands are great for use in retail settings or for portable presentations. The hook & loop attachment system makes set-up and take down a snap. The aluminum center pole adjusts from 36" - 96" tall, giving you maximum flexibility in both size and design. Our standard vinyl graphic is printed on a smooth 14oz. scrim vinyl. For even better print quality, colors and durability, choose our high-resolution 15oz. vinyl graphic. For the ultimate display, choose our premium graphic, printed on a polyester photographic film with a protective overlaminate. 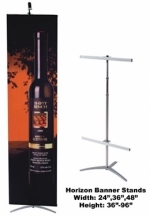 Either way, you'll get a stylish, attractive and versatile display at a terrific price. Graphics are unsewn for a crisp, clean look. You can provide your own art files for printing (graphic size should be 24" wide and between 36"-96" tall) or we also offer professional design services. Quick turnaround, rush service is available. 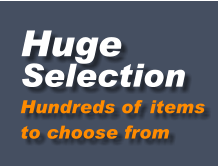 Call for big discounts on large quantities. Graphic size is adjustable. Prices will vary depending on the size of graphic you choose. Accessory carrrying bags and halogen lights are also available.